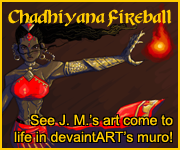 If you follow me on social media or subscribe to my mailing list, you are already in the know: Chadhiyana #3 is now available through comiXology (from Rosarium Publishing). With the release date originally projected for today through Tuesday, this was a bit of a surprise. In fact, the book was released two days ago on the site. ComiXology has had a habit of releasing these issues a few days early, and as I’m quickly learning and someone privately quipped to me yesterday, release dates don’t seem to mean much. That’s quite all right with me; this is not a complaint by any means! After all, I’d rather a book come out early than late. That said, it has been something of a (unintended) long wait between issues 2 and 3, and for that I do apologise. Despite my commitment to and love for this creation of mine, I had some difficulties bringing this most recent issue together (for reasons I’ll remain silent on), though I am very pleased with the result. 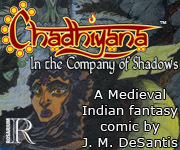 Issue 3 is something of a landmark in the series, as it is the first issue with entirely new content which did not formerly appear in the story’s web-comic run. I also feel it’s the point at which the story really begins to pick up (which continues in issue 4 with something of a twist). More, as I said in my previous blog post, I’ve been very excited to finally feature the Witch on the cover of an issue, as she’s one of my favourite character designs to date and an intriguing character to write, as you will later see. 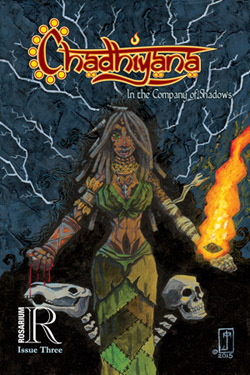 Amazon.com is taking pre-orders on the Kindle version (to be released on Monday: amazon.com/Chadhiyana-Company-Shadows-JM-DeSantis-ebook/dp/B01B11RNT2/) though, again, it’s currently available on comiXology at: comixology.com/Chadhiyana-3/digital-comic/327690. If you’re new to the series, simply visit the Comics Page on this site and you can find links to pick up the first two issues. As you read this, I’m completing my work on the art and making edits to the script for issue 4. Then it’s immediately on to work on issue 5. We’re still some way away from the ending of this thing, but then again, it’s all about the journey, isn’t it? I hope you’re enjoy it.